Notes: Starter has a 3/4 in. offset and fits applications with automatic transmissions using a 157 or 164 tooth ring gear or manual transmissions using a 157 tooth ring gear (Normally 5-speeds). This replaces OEM starters with a 'nose' that extends 2-3/8 in. past the mounting surface. Powermaster Ultra Torque starters live up to their name by delivering 250+ ft.-lbs. of torque. They feature a machined aluminum adjustable mounting block, work with most oversized kickout oil pans, and work great for big cubic inch engines. The starters use a 2.5 kW, in a 3.4 hp motor. Great starter. Start up every time hot or cold. Sounds really strong well it help with 3.4 hp.its a very well made starter one of a better one I have seen. Extremely impressed with the starters power to turn my high compression 406 sbf. Starts easy and doesn't skip a beat. Strong starter. My high compression motor chewed up and spit out a stock starter. 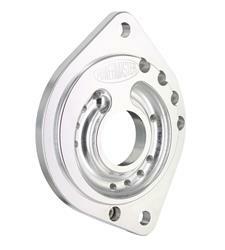 This one is billet aluminum with reinforced ears where it bolts up to the bellhousing. Solid product, well built. This starter is better than I thought possible. It turns my 351W (11-1 compression)over with very little effort. This is a must have starter, you won't be disappointed. This thing is a beast.. no heat soak issues sounds like a jet starting then engine coming to life.